Jesus freak Hideout (Mike Ward): Early in your career, much of your music was inspired by teen angst and emotion. Now that you're in your 30s and more mature, was/is it a struggle making that transition to find new inspiration? Mike Herrera: Sometimes it can be... but I think the struggle is inspiration in itself. We as Americans are so blessed to have the lives we have in this country and there is so much strife out in the world beyond the suburbs that the struggles that we as a band face pales in comparison... but I gotta write what I know. JFH (MW): As veterans of the punk rock "scene," what would you say is the biggest difference between the scene today and when you started? What would you change and what do you think has been an improvement? Mike: The Internet is the biggest change. When we started, bands didn't even have websites. I would say that we need to bring back the value of live music and music in general. It's become a vehicle for products instead of a vehicle for social and political change and ideas, and let's not forget good old fashioned entertainment. JFH (MW): How was your approach to your new album, Secret Weapon, different from those in the past? Mike: We didn't try as hard, so it came out more real and natural. And way better. Funny how that works. JFH (John DiBiase): Can you tell us about the concept of the song "Secret Weapon?" Mike: It's a song for the common man or woman. It's about finding the strength within you to live a better life. To use our free will in a positive way. JFH (JD): How about the video for the song. Where was it filmed? And please tell us those weren't your instruments you smash at the end! Mike: We filmed in downtown Los Angeles, and those were technically our instruments but none we cared about obviously. JFH (MW): Were there any bands or artists that you were listening to that had an influence on the songwriting for Secret Weapon? JFH (JD): Do you have a favorite song on the new record? Mike: I love "Contention" and "Chop Shop" because they're so fun to play. JFH (MW): Can you tell us about the transition back to Tooth & Nail? 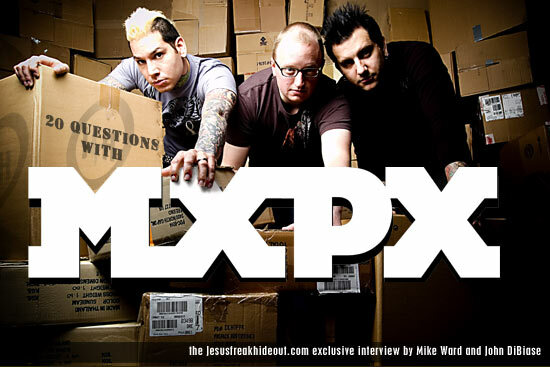 What brought MxPx back to the label after all these years? Mike: Well, a lot happened to bring us back to Tooth and Nail. A lot more than can be written here... but good things. JFH (MW): When writing new songs, do you intentionally try to pacify the two factions screaming "Too Christian!" and "Not Christian enough!" or does that not factor in at all? Mike: I think it's pretty clear that we have not tried to please the mob over the years. We've just tried to be ourselves and to be honest. JFH (JD): Over the years, the band has made the transition from the Christian market to the mainstream and, in some cases, has begun increasing its presence in the Christian market once again. What has brought the band back to things like playing Christian festivals and shows? Mike: When we fired our manager... a few years back, we found out that we had been offered many of these festivals. But they were always turned down and never brought to our attention. So now that we know about them, we are playing many of them. We've always done Cornerstone because we knew about that early on. JFH (MW): What do you do in-between albums to challenge yourselves and grow as musicians? JFH (MW): If you had your pick of any band or artist that you could tour with, who would it be and why? Mike: The Who or The Clash... two of the greatest rock bands of all time!!!! JFH (MW): If there was a song you could un-write, what would it be? Mike: "Bad Hair Day" from Pokinatcha. It's just really dumb and embarrasing. JFH (MW): In all honesty, are you tired of playing "Punk Rawk Show" at nearly every show by now? Mike: Not really. It's still fun cause the crowd loves it. JFH (MW): What is your favorite and least favorite album in your discography (prior to Secret Weapon) and why? Mike: Favorite is The Everpassing Moment, because of the songs. And least favorite is Pokinatcha because of the bad songs and really bad recording. JFH (MW): After a decade in the business, has there ever been a time when you wanted to quit and try something else? Do you ever see a scenario when that might happen or is the plan to "die in office"? JFH (MW): What's the deal with Tumbledown? JFH (MW): What bands are you listening to now? JFH (JD): What's been the best movie you've seen this Summer thus far? Mike: Live Free or Die Hard!! Pretty cool. Mike: Check out Secret Weapon and you won't be disappointed!!! And thanks for all your support! MxPx's latest album, Secret Weapon is in stores NOW!